Michael, the cat, is about 8 years old. Tom, the puppy, is almost three months old. They’re about the same size, though not for long. Michael is craftier. Tom is louder. Michael has sharper claws. Tom has sharper teeth. Michael can jump. Tom’s mouth is bigger. Michael can control his bladder in the excitement of a chase. Tom, sadly, cannot. Michael wins when he has the higher ground. Tom wins if he catches Michael on the floor. Michael would like to eat Tom’s treats, and vice versa. They’ve been working out their business over the past few weeks. A casual bystander might just notice an over-excited puppy rushing at an annoyed cat every chance he gets, and the cat leaping over baby gates to escape. There is a lot of this. Tom can barely contain his excitement when he sees Michael. He tries to play with him, then barks at him, then just pounces on him. Poor Michael. But closer observation reveals a cat who is instigating things half the time. Michael sashays past Tom when Tom can’t reach him, dangles his tail in front of Tom, and reaches down from stools and counters to take a swipe at the unsuspecting pup whenever he walks by. Tom doesn’t seem to look up very often, so this gets him every time. Poor Tom. 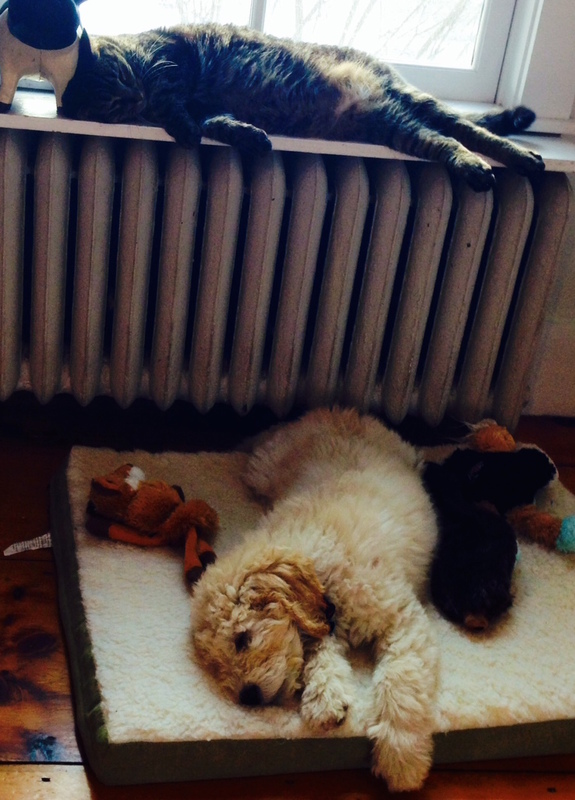 Fortunately for all of us, they both like a good nap.